At Hinckley, we’re committed to you, our clients, throughout your entire boat ownership. This starts with a dedicated sales director to help find the ideal boat to fit your needs, a conscientious project manager during the build, and a service manager to maintain your yacht to perfection. Lastly, when it comes time to put your boat on the market, our brokerage team is ready to lead you through the process. Here are our five recommendations to confidently go about selling your Hinckley or other fine yacht. When a potential buyer steps aboard, you want your boat to be cosmetically impeccable in all aspects. Be prepared for buyers to open drawers, check under the soles, and peer into lockers. Stained and sun-faded upholstery, scratched woodwork, and strong odors discourage buyers. Consider contacting your service manager to get your boat detailed to ensure white-glove cleanliness with nothing overlooked. Before she even gets off the dock, your Hinckley should be looking, smelling, and sounding great. Don’t give a buyer any excuse to turn to another boat. To make sure that the sale of your boat goes off smoothly, get ahead of any repairs and updates. When it comes to retaining the value of your boat, maintaining it to a high standard is essential. That’s why we recommend storing your boat with Hinckley Yacht Services. As the designer and builders of the boats, Hinckley service yards are best equipped to service a Hinckley and have standard prices for each of our models. Buyers prefer Hinckley maintained boats. Make sure you have the proper documentation to sell the boat, such as the Bill of Sale. This is also a great opportunity to show off your service records, if you them. Buyers like seeing the proof of how the boat was cared for. If you have any questions about the necessary paperwork, you can always turn to your broker for help. The right broker is someone who not only knows your boat inside and out, but understands the market, both locally and in other regions of the country. Having professional contacts and access to potential buyers will lead to a faster and more fruitful sale. Listing your boat with Hinckley means that everything is taken care of by your broker. We prioritize making the selling process as convenient as possible for owners. As Joe Dwyer, a Hinckley Yacht Broker based in Portsmouth, RI, says, “I take care of everything for you. I clean the boat, take the photographs, put them online.” This hassle-free process with a trusted Hinckley representative allows you to reap the benefit of their knowledge and background. 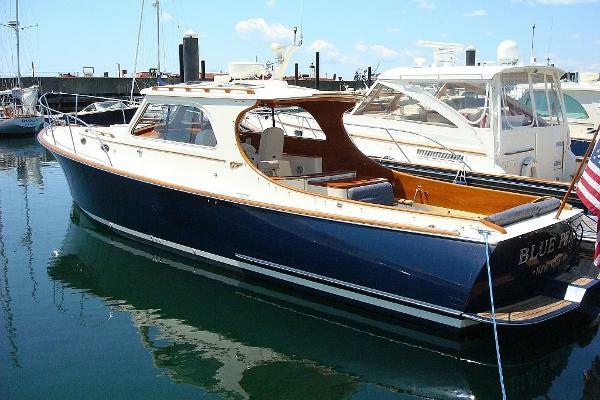 Our brokerage not only represents Hinckley yachts for sale, but several other high-end makes as well. We currently have listings for Little Harbor, San Juan, Marlow, and Windsor Craft motor yachts in addition to Cherubini, Alden, and Irwin sailboats, which serve to deepen our understanding of top quality yacht markets. Furthermore, Joe stresses the importance of understanding the seasonal trends as it relates to your location. For those in the Northeast, Joe recommends, “putting the boat on the market in the fall before the holidays,” as buyers want to head into the following summer season with their new yacht ready to go. The fall boat shows in are also a great option to have your boat seen by a large number of people. The right broker will be able to implement this plan on your behalf. Don’t be afraid to use your boat while it is on the market. 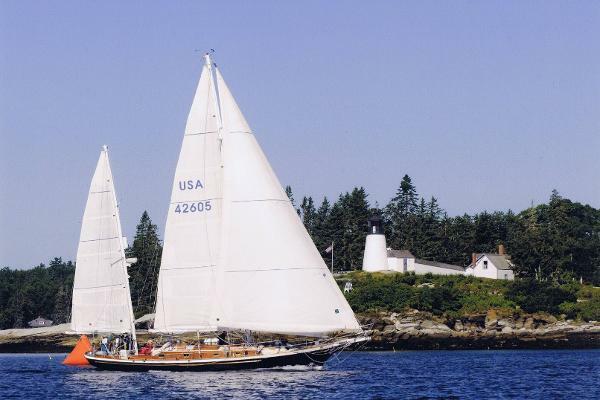 Take Silhouette, the Cherubini 44 Clipper Ketch currently listed with Joe. She just finished first in her class in the 2015 Marion-Bermuda Race, her second win in that race in which she has competed six times. This bluewater racer has been kept up at a competitive level which is certainly getting her noticed. Nothing says “buy this boat” more than literally leaving the competition in her wake. Using you boat not only gives you the joy of ownership until the very end, but turning heads in the harbors is always a plus. This is also true for lending your boat to participate in Hinckley Yacht events, such as demo days or sponsored events. Talk to your broker to learn more!